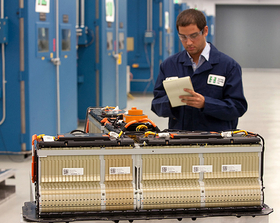 A battery engineer checks a Volt battery at the GM Global Battery Systems Lab. General Motors Co., preparing to launch the first U.S. mass-market plug-in hybrid, will offer buyers of its Chevrolet Volt an eight-year, 100,000-mile (about 161,000km) warranty on the lithium-ion battery's 161 components. The warranty also includes the battery's thermal management system, charging system and electric-drive components, GM said. The Volt, which goes on sale in the United States in October or November, can run for up to 40 miles on battery power before it switches to power from a gasoline-powered engine. A battery can charge in eight to 10 hours on 120-volt power or about four hours through a 240-volt hookup. GM intends for the warranty length to give customers confidence in the Volt's unfamiliar plug-in technology, said Micky Bly, GM's executive director of global electrical systems, today at GM's battery plant in Brownstown Township, Michigan. “It's one less question for the dealer,” Bly said. GM has not announced the warranty for the Volt's gasoline-powered engine, but Bly said it would be at least as long as GM's standard five years or 100,000 miles. The Volt battery's longevity stems in large part from the liquid heating and cooling system that keeps the battery at optimal temperatures. The Volt is the only such mass-market vehicle with a liquid-powered thermal management system, GM said. For example, the Nissan Leaf electric vehicle has an air-cooled battery. Nissan hasn't released warranty information for the Leaf, which goes on sale in December. The Brownstown plant has been building prototypes for Volts since January and will soon start batteries that will go on vehicles destined for customers' garages. Charles Child contributed to this report.